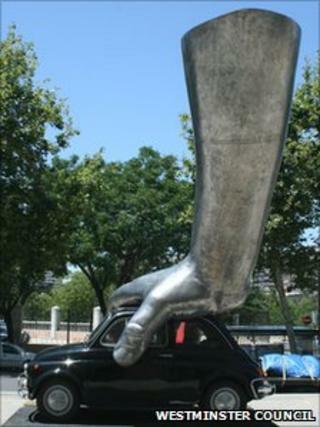 A sculpture of a giant silver child's hand bearing down upon a car will be placed in London's Mayfair. The artwork by Italian sculptor Lorenzo Quinn, titled 'Vroom Vroom', has been given planning permission by Westminster Council. The 15ft (4.6m)-high piece will go on display on the central reservation in Park Lane at its junction with Stanhope Gate in central London. The work, featuring the artist's first car, evokes the child within, he said. The council has yet to finalise when the artwork will go on show but it will be on display until April 2011. The planning application said although the artwork will be placed "between busy traffic lanes" it was not expected to pose a danger to traffic. The sculpture was on display at the Institute of Modern Art in Valencia during the summer and will also feature at the Abu Dhabi Art Fair. Previously Lorenzo Quinn has said: "We are all a child at heart, and it's important never to forget the child within you." Paul Green, president of Halcyon Gallery which is supplying the artwork, said: "This is extremely important for Lorenzo Quinn. We are really looking forward to seeing the public's reaction." Councillor Alastair Moss, chairman of the planning application sub committee, said: "I think that many people feel a fondness and love for their first car which stays with them for a lifetime, and I hope this artwork brings a similar feeling of excitement to the many people visiting the West End." The installation is part of the council's two-year City of Sculpture Festival during which 60 pieces of art donated by galleries and artists will temporarily be on show in the run-up to the 2012 Olympics.